According to The US Census Bureau, somewhere between 58 and 64 million people go to the beach each year in the United States. The beach has been a popular destination for generations. It still continues to impress year after year. Exploring a deserted beach, climbing on the rocks in a breaking surf , jumping into oncoming waves, picnics, sun bathing, bonfires, and all manner of beach sports are just as fun today as they ever were. Though I would never go so far as to say that going to the beach is “fraught with hazards,” there are quite a few things that could happen. We outline what should be in your beach first aid kit below. Packing a DIY first aid kit is as simple as adding items to your cart on Amazon and finding something to pack them in! Do you carry a beach first aid kit? If you are anything like the vast majority of roughly 60 million American beach goers each year, you probably don’t. But you should. Minor cuts and scrapes, sunburns, jellyfish stings, and all manner of other minor injuries could be easily treated with a basic first aid kit, but often times no one seems to have one. Minor injuries can lead to big discomforts if left untreated, turning an otherwise great day at the beach into a miserable experience. Preserve your day and preserve your trip by being prepared. 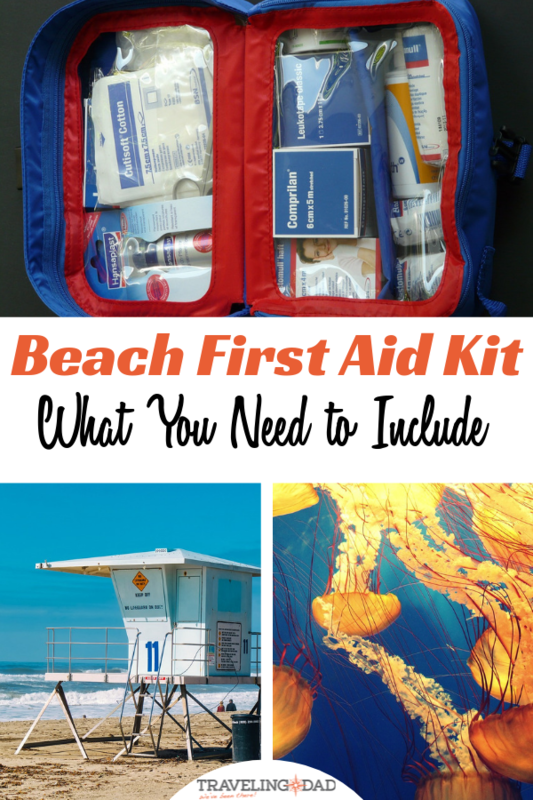 A beach first aid kit does not need to be huge, bulky, or expensive. Make it simple, light weight, and tailor it to what you are likely going to need. We’re starting you off with this list of first aid supplies. To learn how to treat common beach injuries click over to TravelingMom for a full list and step by step instructions. Plan to have a small collection of band aids (in varying sizes), gauze pads, and tape. My wife likes to store our adhesive bandages in a small plastic file fold (commonly called a coupon folder). This is a great item to pick up because you can also “file” gauze pads and medication sheets as well. Infections are a very real thing. Make sure you’re bandaging things with clean hands. It’s important to pack some basic medication that might come in handy. Pain-relief medication can be used for anything from bee stings to severe sunburn. Tylenol and Advil are great options. Along the same lines as an ace bandage, you’ll be happy to have them in your beach first aid kit. Ice packs can make a big difference in how the day goes. You can activate them to ice a rolled ankle, a black eye from a rogue volleyball to the face or to assist in the treatment of a heat related emergency. To read more on how to identify heat stroke, heat exhaustion, and how to treat them jump over to this post where I discuss it in depth. Tweezers are a must have item for removing anything number of little things that could become embedded the skin. From splinters to broken glass to jellyfish stingers that could be embedded in the skin, tweezers are an essential beach first aid kit item. The importance of having an unopened bottle of water cannot be overstated. It’s perfect for washing sand and other debris from small cuts. You can also use it to flush sand or salt water from an eye. Make sure to keep this particular bottle of water separate from your drinks. Why? Let’s just say it is very unpleasant to use ice cold water for medical purposes (like flushing). Along the same lines of the bottle of water I’d put this on a beach essential list. It will make a great eye wash for removing sand and is easier to use for small kiddo eyes. Aloe vera gel is tried and true and works just as well as anything else on the market. Anyone who had used Aloe Vera on a sunburn knows that it is the first thing to reach for. To be fair, this doesn’t really need to be in the first aid kit. There are usually copious amounts of it strewn about the car to begin with. For the sake of being complete I’m including it here. Besides, having a backup supply of sunblock is never a bad idea. Someone ALWAYS forgets to bring it and you could “save the day” for a total stranger. White vinegar is just about the best thing to treat jellyfish stings. Yes, we know you want to pee on your buddy but it doesn’t really work. Note: To read steps to take to treat a jellyfish sting click on over to TravelingMom’s article about how to treat common beach ailments. One of the fun parts of the beach? Bug bites. Of course, you should apply bug spray before hitting the beach but somehow a bite or two always sneak through. Bring anti itch cream to stop kids from itching the bites and opening themselves up to possible infection. While these may not be needed for an emergency this is something you should consider for your beach first aid kit. Many kids have sensitive ears and a few ear drops prior to water immersion can make for a happier kid later in the day. If anyone in your family is allergic to bee stings be sure to pack an epi-pen for the treatment of allergic reactions. Epi-pens are dependent on being stored in the proper temperature range to work properly. Consider investing in a proper carrying protective case for it. This should be obvious to most of you but the beach is wet and dirty. Your first aid supplies are going to do you no good if they aren’t kept protected. Be sure keeping your first aid kit dry is a priority. There are numerous options for what to put it in. Personally, you’d be surprised by how well a lunch box works. It’s easy to carry, zips or snaps shut to keep sand out and if you use an insulated one it can protect the contents from heat. You’ve got your first aid kit and are ready to hit the beach. Be sure to hop over to TravelingMom to read up on the treatment of common beach injuries and issues. After all, a first aid kit without basic knowledge of first aid just becomes added weight. Remember, if at anytime you aren’t 100% sure that you have control over the situation, seek help. If the situation turns into an emergency, call 911 sooner rather than later. It can be very difficult to locate someone who calls for 911 in wide open and crowded areas (speaking from experience on that one). Appoint someone to flag down and guide paramedics to the patient. This can make a BIG difference in a true emergency. With your DIY first aid kit packed and ready to go you’re ready for a fun day at the beach. What else would you add to a beach first aid kit?